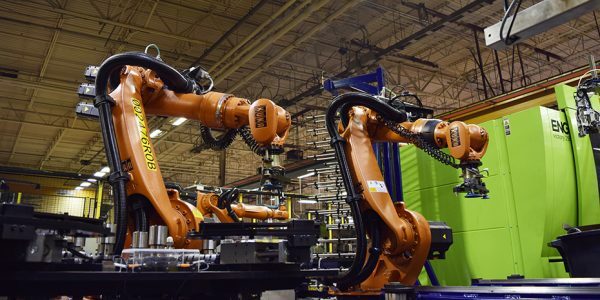 ABCO electrical engineers have strong design and PLC, robot, and vision programming skills, providing solid optimization of various robotic, PLC, HMI, and industrial controls devices. Our experience includes custom automation, robotic, vision, and motion capabilities. ABCO engineers design and program systems to be safe, operate smoothly, and to be easily maintained. As an experienced integrator with vast engineering knowledge and capabilities, we work to optimize cycle times as well as yield higher throughput. The result is improved quality and reduced production costs. Achieving the best outcome when purchasing a custom, complex automated system requires an automation company with the right skill set. From design to on-site installation and set-up, ABCO Automation’s electrical engineers offer a range of services all under one roof and support ABCO clients from start to finish. ABCO's controls and electrical engineering teams provide controls design build and programming for all major electronic and software components. A value-added service to our existing clients includes controls upgrades for legacy systems and machines. Detailed schematics and source code are included in our standard documentation process. When there’s a need for high-volume and precise demands in factory automation, PLCs (high-speed, programmable computers) are a necessity in automation and provide manufacturers with a competitive advantage. Automating a production process requires an understanding of the manufacturer, understanding the system, and then programming the PLC to handle what was once a much slower manual process. Some manufacturers require continuous monitoring of the status of inputs and outputs. ABCO is well-versed in safety PLC to meet safety requirements, such as functional safety commands or to define the level of risk reduction provided by a specific safety function. HMI software applications are custom programmed for each PLC. ABCO offers a wide range of motion and machine controls and can integrate into any custom automation system. Our electrical engineers are highly knowledgeable about controls, motors, and drives, and they can offer the best solution for each custom system. As a value-added service to our existing clients, we will also consult on existing systems and recommend upgrades when applicable. Conceptual equipment and systems controls strategy consultations are also available. ABCO has developed techniques and algorithms for a wide range of custom applications using machine vision. Solutions include automated inspection and quality checks, optical character recognition, and more. We are also adept with robot vision which blends aspects of robotics into its techniques and algorithms. Robot vision applications include motion detection, unstructured bin picking, and material sorting, to name a few. A value-added service to our existing clients includes controls upgrades for legacy systems and machines. ABCO Engineers have experience with custom automation, robotic, vision, and motion capabilities.